Resurrection of the Little Match Girl takes you on an exhilarating ride on the verge between dream and reality. Delivery boy Ju is absorbed in his life's only worthwhile occupation, playing computer games, when he gets drawn into the world of the fairytale character Little Match Girl and receives orders to save her at all costs. Facing overwhelming odds, the uneven couple stumbles from one risky situation to the next. Geez. Where to start with this one? Resurrection of the Little Match Girl really is a bit of a mind-f*ck. Cross computer games with reality, throw in Hans Christian Andersen's fairy tale The Little Match Girl, blend for 126 minutes and then serve. What you are left with is a film where reality and virtual reality are easily confused, people become game characters, and lots and lots of violence. "I've got a gun, and I'll use it!" This film is quite famous for one main reason, and unfortunately it is not a good reason. 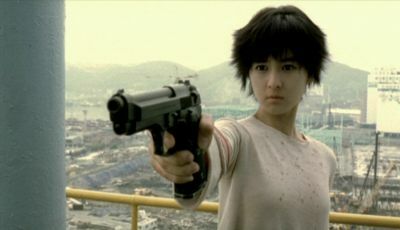 It was one of the biggest budget films in Korean cinema history, and took something like 4 years to complete (how it took that long I don't know!). In the box office, it flopped - spectacularly. It was a monumental failure. 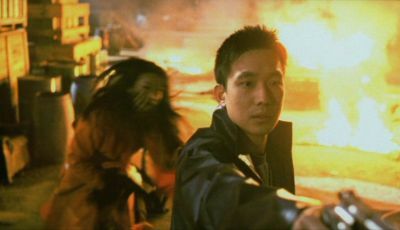 Along with a couple of other big budget films which also flopped, Resurrection of the Little Match Girl helped draw in an era of panic in Korean cinema, as money was lost, budgets were reduced, and it appeared risks in the cinema industry were quite significant. It appears as though, for the time being anyway, big budget blockbusters are no more. In film style though, Resurrection of the Little Match Girl is bound to get a cult following in due time. "Well, I've got two, and I'll use both!" First I should probably point out that the Korean Enter One release of Resurrection of the Little Match Girl, like stated in the specs above, does not have English subtitles. However, if you search the web, join the right forums, you can find fan subtitle groups where people have released english subtitle scripts for this, and other films. Using your DVD-Rom drive it is then possible, with the right software, to activate the new script while watching the film, and therefore you are then able to watch it with English subs. Anyway, at some points it is difficult to decide whether the english subs help understand what is going on, or just confuse you even more! Resurrection of the Little Match Girl is a very strange film. It has a reasonably linear plot, yet it is very obscure, so I'll do my best to try to explain the basics of what the film is about. First, though, it will definitely help if you are familiar with Hans Christian Andersen's The Little Match Girl. Read this. "If only I could figure out how I did it..."
Up to speed? Well the setting for this film is Korea, and an organisation called System have set up a game where the object of the game is to make sure the Little Match Girl freezes to death, as in the fairy tale. However, to be the true winner of the game she has to be thinking/dreaming of you when she freezes to death. To do this you must obtain her love and save her, then you will be able to leave with her for a world of happiness. We are told this as if we are watching a computer game, and are being given the options of whether we want to play or not, however the viewer is also warned that rashness and clumsiness may also cause you to never be able to return to this world. Are we watching a film, or a computer game in progress? The game options which frequently come on screen help confuse and blend the two together and very soon reality and the game become quite indistinguishable. "At last, a bigger gun! Who says size doesn't matter!" A delivery boy, Ju, encounters the Little Match Girl and soon learns of the game and its objective. He also quickly discovers several of the other people playing the game, and the violent methods which they use to try to win. From learning from one of the seasoned characters in the game, Lala, his game stats soon start to improve as he progresses through the game. In his game, the Little Match Girl is identical in appearance to a girl that he has a crush on in his reality, Hee-Mee. This is something that can get confusing, as after encountering the Little Match Girl for the first time, he initially thinks she is Hee-Mee, and so he calls Hee-Mee's work to see if she is there... and Hee-Mee answers the phone. So what is reality, what is the game? My advice, try not to think about it! It just gets more confusing! 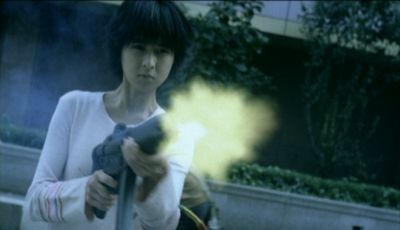 At one point Ju finds the Little Match Girl, and saves her while she is freezing to death, but when he wakes he finds that she has left, and taken his automatic machine gun with her! Soon there is a psychotic gun-totting Little Match Girl, shooting everyone who brushes her off or gets in her way. This is not supposed to happen in the game, so the developers, System, want her brought back in so they can reprogram her, and remove the virus - which they determine to be Ju. Having begun to develop feelings for her, Ju, with help from Lala and a couple of others, hunts down System's headquarters in order to save the Little Match Girl and free her from System. "Oi! What you doin' behind my back?" You know, I don't think any of what I wrote above really makes that much sense. But if you watch the film then you'll see where I am coming from. The boundaries between reality and the game don't even appear to exist in some places, whereas in others, it appears as though it is clear that it is all just in the game, and reality is completely separate. 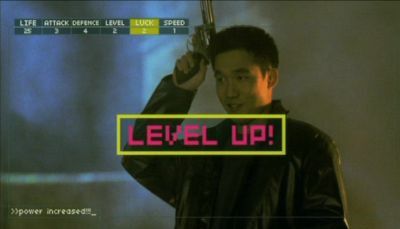 Like in a game there are several endings to the film, most of which are "You Failed - Game Over" endings. The first of those occurs very shortly after the game has started, and that ending is the first indication that there even was a game going on in the first place! Prior to that point everything appeared as though it was in reality. At the actual end of the film, there are two further endings to the game, one of which again separates the game world and reality, the other of which blends the two even more together so you have no idea whatsoever where you are. "Don't ask about my gun, cause it's really a fish... seriously!" Anyway, I'm going to stop trying to explain the plot before I go absolutely insane. The thing you are possibly asking yourself just now is "If the film is that bloody confusing, is it really even worth watching?". Well I think it is. If you like David Lynch style stuff then I'd imagine you'd like this. The film as a whole is quite stylishly done, and it moves along at a good pace, making sure that whenever you think you are just beginning to get it, something else happens to make you think even more. 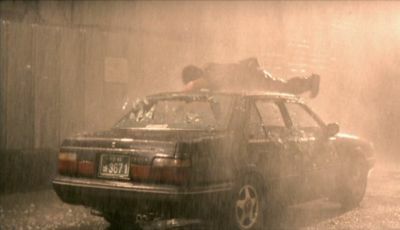 There are plenty of violent action scenes too, in which people get shot left, right and centre. Innocent civilians are shot down without any hesitation, enemies to the 'game players' appear frequently, most of which are the drone bad guy type, there just to get shot, and once the Little Match Girl has her gun, no one is safe! "If I have to think about this film for a second more I'll..."
v The action is geared like in a computer game. As a character has been playing the game longer, their apparent powers in the game improve. The likes of Lala, who has clearly been playing the game for quite a while, can do things which are simply not possible in reality, and is truly deadly. Whereas Ju, in his first battle, is pretty useless, and it is only when he makes his first timely kill to save Lala, that you see his stats increase. By the films finale he has gained significant amounts of experience and as such is able to fight, shoot, and perform infinitely better than when he first appeared in the game - or should that be film... I dunno! 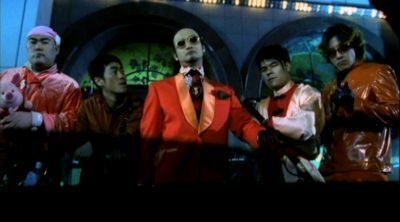 Most of the set pieces are well shot, and choreographed, with bullets flying around all over the place, and more than adequately satisfy the action side of the film! The end scenes within System's building are very trippy indeed, with there being no apparent physical laws whatsoever, as environments change and the game world really takes over. Great eye-candy though! So the plot is very difficult to follow at times, there are ample amounts of bloody violence, and it is good to look at, but is Resurrection of the Little Match Girl actually a good film? My first impression was that is was only ok, but could have been so much better. Maybe that was due to expectations I had for it. 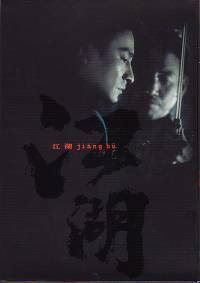 On the Asian film forums which I am a member of, there was a lot of hype surrounding this film, possibly even more so once it was established that the dvd wasn't going to have english subtitles. The lack of english subs meant a lot of people that would have bought the film, now weren't going to, so the hype surrounding it stayed, as few people watched the film and were then qualified to play down the hype. Having now watched it, and thought about it more, I realise I enjoyed more than I first thought I did... and possibly will appreciate it more on repeat viewings. The main problem with the film, which in some ways is also one of its stronger merits, is that the film is very confusing. The blending of reality and the game, I thought, becomes quite ridiculous at times, and understanding some of the game points is reasonably difficult. I'm still not sure what the significance of the yellow butterfly is... Is it there to establish the start and end of the game? I don't know. Is Ju's friend Lee just part of the game, or is he in real life as well? The amount of questions which you'll have at the end of the film is staggering. However, like I said this is also one of the stronger merits for the film - it is very thought provoking. It is towards the end of the film that the CG effects begin to really kick in, and the film becomes even more game like. 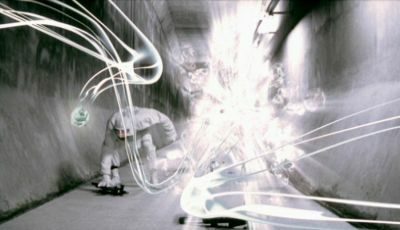 Alas not all these CG effects are that great, and some of them do look a little fake, although cleverly done. "What decade is this? Are our clothes fashionable?" Resurrection of the Little Match Girl is a film unlike no other. It takes a classic fairy tale and brings it into the MTV generation of the 21st century. The film will confuse you, there is no doubt about that, and there is also a very good chance that people who see the same film won't be able to agree on what is real and what is not. It is visually appealing, and there is enough action to keep you happy. Just don't dismiss the film once you start to lose the plot, give it a chance and see it through, you may be pleasantly surprised! 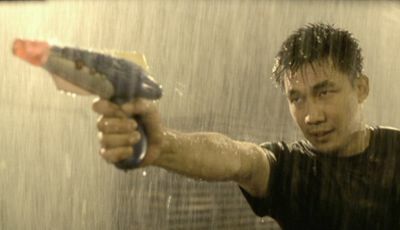 "There's nothing like a good fight in the rain, except when I'm losing." The lack of English subtitles on the DVD has helped increase Resurrection of the Little Match Girl's cult status, as there are many english speaking Asian cinema fans out there dying to see this film. Many of whom are desperately hoping that Hong Kong Legends pick up the UK distribution rights to the film. While they would in all likelihood produce a high standard DVD with English subtitles, having seen the film I could understand why HKL may not pick this film up, as I can't see it having the commercial appeal and ease of access which most, if not all, of their other titles have on both the HKL and Premiere Asia labels posess.